Good news if you're a fan of Highlander and tasty fried chicken. You will be able to indulge both of those awesome tastes by heading over to Catch of the Day Tee on Friday November 18th. For only $10 you will be able to get this awesome design printed on a T-shirt and for a small extra charge they will even deliver it to you as well. 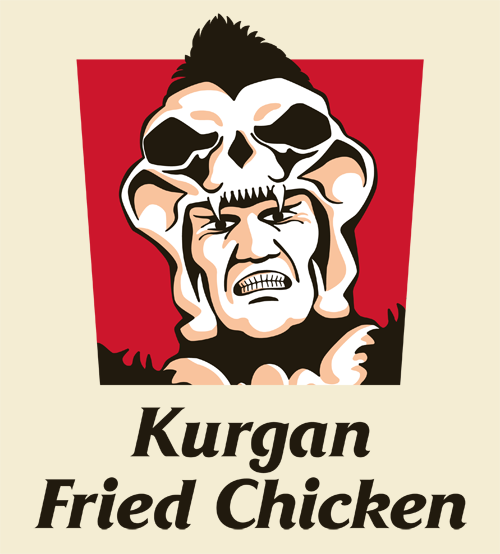 As Queen told everyone in the song One Vision, the Kurgan loves a bit of fried chicken. If he had decided to run a fast food joint instead of beheading all the other immortals, this is what it would have to be called. So show some support for the reformed Kurgan and buy this tee. There can be only one! (not literally of course, there will probably be as many as you want to order).